« GRB 110328A: First ever observation of a newly formed quasar! 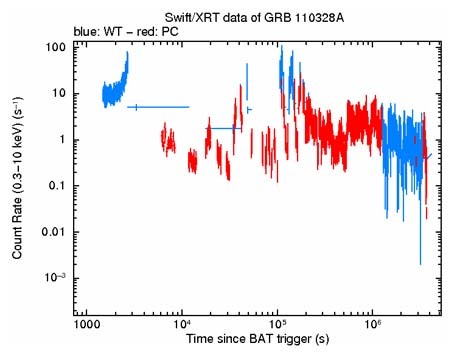 In response to Nick Darby’s comment on the previous post, a few days ago I checked with one of the Swift team astronomers, Jamie Kennea, who said that the source is “still well detected.” Swift observes this source daily and posts the data on the following page on their website (http://swift.gsfc.nasa.gov). Enter 110328A in the homepage search box and refer to found links. As seen from the X-ray light curve posted at http://www.swift.ac.uk/xrt_curves/00450158/, the source is still very active with no indication it is dying down, as some astronomers had expected; see graph below. This shows that as of the date of this May 10th posting quasar source GRB 110328A has been active for one and a half months. So time is rapidly running out for the black hole snack theory. Those wishing to follow its progress on the Swift website, note that the source is also referred to as Swift J164449.3+573451. Astronomers now have revised there estimate, indicating the event may last a year. If it lasts longer, will they then predict the consumed star was larger, or that a series of stars are being consumed? Is the presence of synchrotron radiation consistent with this infalling material model astronomers are using to explain this event? More than a year has now gone by, and the light curves have decreased rather steadily over three orders of magnitude. Can we conclude that this may be a typical event in the birth of a quasar? And can the ‘black hole snack theory’ also account for this type of relatively long-term event?